Born in Madrid, Spain, in 1947. Better known under his pseudonym, “OPS” Andres Rabago is one of the most prolific among the younger generation of Spanish cartoonists. 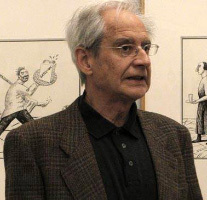 Since 1965 he has had cartoons published in the daily newspapers Informaciones and Pueblo and in the national magazines España Económica, Cuadernos para el Diálogo, Triunfo, El Cárabo, La Estafete Literaria, Criba, La Codorniz and Hermano Lobo. He has also contributed to the foreign magazines Pardon (Germany) and Euroka (Italy). His published books include Los Hombres у las Moscas (“Men and Flies”), Mitos, Ritos у Delitos (“Myths, Rites and Trespasses”), Ovillos de Baba (“Tangles of Dung”) and La Cebada al Rabo (literally “The Barley by the Tail,” an expression signifying misspent effort). Rábago also made a short cartoon film. Edad del Silencio (“Age of Silence”). The OPS cartoons are directly connected to Goya’s “Black Spain” on the one hand, and to the aesthetics of surrealism on the other – but only to its aesthetics, because OPS’s humor does not spring from the irrational but from real features of our society: avarice, false morality, hypocrisy, crime, insensitivity. OPS’s cartoons create in their readers a sense of discomfort and unease; they are the most overtly black and cruel in Spanish publications today.